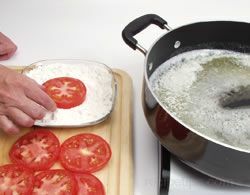 Wash tomatoes under cold running water. 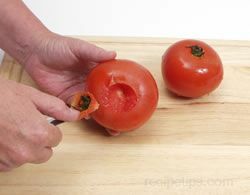 Core tomatoes by removing the stem with a paring knife. Do not remove the skin. 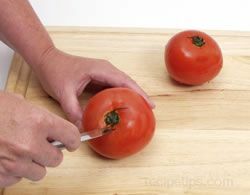 Slice into 1/2 inch slices. 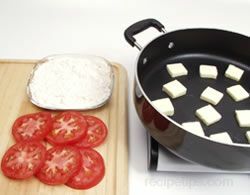 Distribute slices of butter in frying pan. Preheat pan to low/medium, melting butter. Be careful not to burn butter. 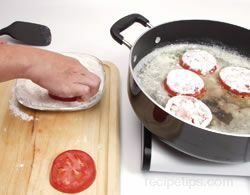 Dip both sides of tomato into flour and place in frying pan. Season with salt and pepper. 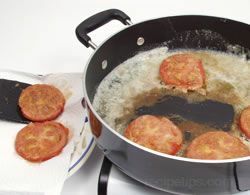 Turn when tomatoes have turned a golden brown. Remove and place on paper towel to remove excess butter. 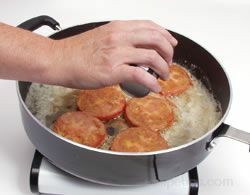 Serve with mayo or ranch dressing if desired.